The OuluHealth ecosystem comprises several stakeholders from academia, the public sector, and the private sector. The principal idea is to facilitate open collaboration and to accelerate innovation by bringing together various partners able to answer today’s and tomorrow’s health care needs. 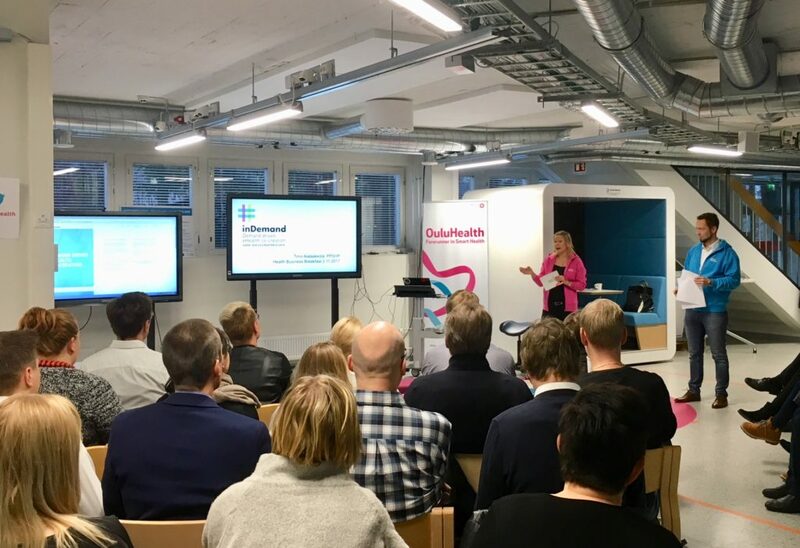 OuluHealth organizes regularly events for the ecosystem stakeholders and Health Business Breakfast was one of them. This event gathered on Friday 3rd of November about fifty participants in the Oulu University Hospital testbed. Local companies listened to the latest OuluHealth ecosystem news and got to know each other better. It was also an excellent opportunity to introduce the inDemand –project to the participants. inDemand was presented by Mr. Timo Alalääkkölä, a Project Manager in charge of a test and innovation environment at the Oulu University Hospital. He explained the objectives and the content of the inDemand –project as well as the application process for companies. Companies were interested in new co-creation possibilities offered by the University Hospital and are looking forward to the inDemand call early next year.